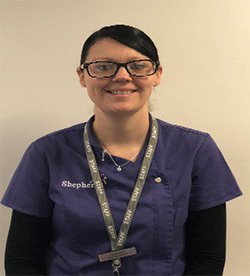 Leanne Allsop joined Shepherds in February 2017 as our Head Receptionist. Leanne came to the practice with a great deal of management experience and was recruited to support our receptionist team in delivering a great customer experience. 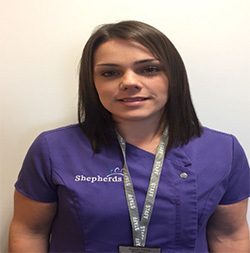 Louise has worked as a receptionist for Shepherds since 2003. Louise is based in our Bridgend Hospital. She has progressed to senior receptionist. Outside of work she enjoys spending time walking her dogs and seeing family and friends. 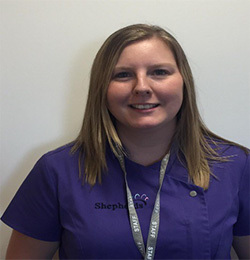 Jo has worked at Shepherds the vets since 2012. Jo originally worked at the beeches as a kennel assist and then moved to the Hospital in Brackla. Jo left Shepherds for a short period where she worked alongside her family in a boarding kennels. 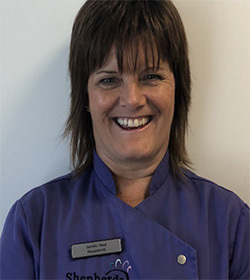 Jo then returned to Shepherds as a trainee nurse and after a short time decided to join the reception team where she has enjoyed working since. 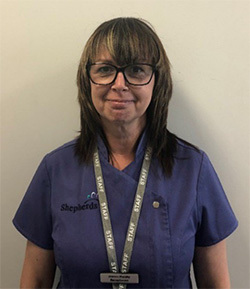 Diane has worked for shepherds since 2002 in the Port Talbot branch. She is the sole receptionist in Port Talbot. She loves spending my spare time with her daughter and granddaughter who she will tell you are “my life”. She also has a Guinea pig called Rocket to whom she can often be found talking too. 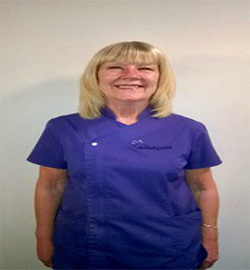 Angela joined Shepherds in October 2014 at the Porthcawl branch. She is the sole receptionist in Porthcawl. Angela had previously worked as an administrator for Spar for 30 years before being made redundant in 2012. She chanced on the vacancy when bringing the newly acquired family pet in for treatment. She has very happily settled in at the Porthcawl branch and loves meeting and greeting the furry patients. When not at work she loves foreign travel. 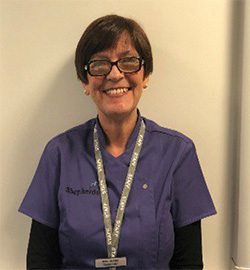 Tracy has worked as a receptionist at Shepherds since 2012. She has always liked animals and grew up with them as a child. She has 2 cats named Tide and Cloud and 2 guinea pigs named Chase and Ryder at home. In her spare time, she enjoys spending time with her son playing football and enjoying the outdoors. 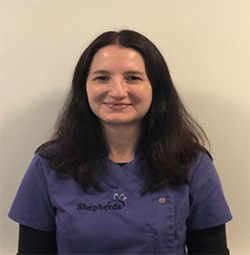 Helen Jenkins, has been employed by Shepherds the Vets since 2017 on a part time basis as a receptionist. She joined the team after being made redundant from Bridgend County Borough Council as an administration officer. In her spare time, she loves to spend time with her family and grandson. Her and her husband also like to travel around the country attending race meetings, especially ladies’ days. 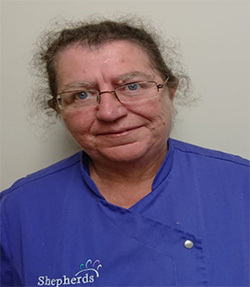 Linda Harding started to work at Shepherds in January 2017. Linda is an animal lover and a responsible owner of 5 small dogs. In her spare time, she enjoys spending time with her three children and her three grandchildren. 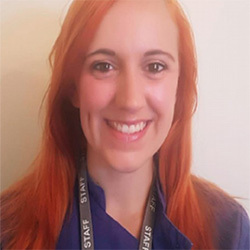 Liz joined the reception team in October 2018, after spending time travelling the country as a military wife. Previously she worked within the Department of Working Pensions and has an extensive background in customer service and administration. 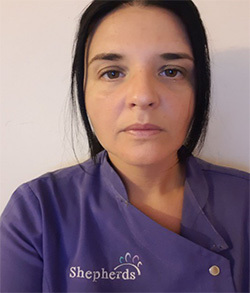 Jo started to work for Shepherds in January 2017. Jo works as a receptionist. After working 11 years as a hairdresser Emma decided to change career and is looking forward to new challenges she will face. Emma loves animals and has her own cocker spaniel named Dino who is four years old. In Emma’s spare time she enjoys going on long walks with Dino. 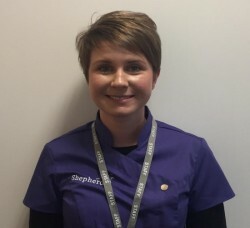 Steph joined Shepherds the Vets in October 2018 having previously worked at Tesco’s office in Cardiff. 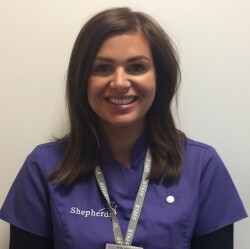 Steph says “I spend most of my time running after my one year old so have little time for hobbies, although I do love a shopping trip once in a while.” Steph has a dog called Max who is a lab cross collie and is 8 years old. 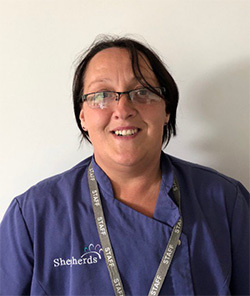 Kirsty joined Shepherds the Vets in February 2019 after deciding on a career change. Previously Kirsty was a qualified semi make-up artist and enjoyed her work, but decided she would like something that offered her more variety and fast pace.